The contentious Senate debate over Judge Neil Gorsuch’s nomination to the Supreme Court has cast a spotlight on deep partisan and ideological divisions in Congress – and in the public – over how the high court should interpret the Constitution when making its decisions. About half of the public (46%) says the U.S. Supreme Court should make its rulings based on its understanding of what the Constitution “meant as it was originally written,” while an identical share says the court should base its rulings on what the Constitution “means in current times,” according to a survey conducted in October. Public opinion about this issue has changed little in recent years. 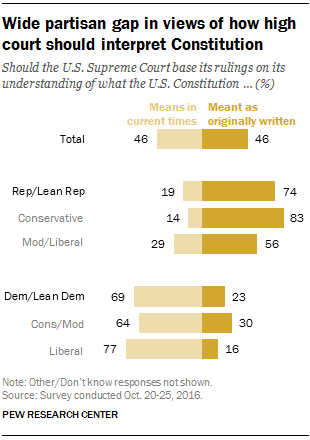 Republicans and Democrats continue to have very different views about how the Supreme Court should base its rulings: About three-quarters (74%) of Republicans and Republican-leaning independents say it should base its rulings on its understanding of the Constitution’s original meaning, while about a quarter (23%) of Democrats and Democratic-leaning independents say the same. This gap is slightly wider than it was in February 2014, when 68% of Republicans and Republican leaners and 27% of Democrats and Democratic leaners said the Supreme Court should interpret the Constitution based on how it was originally written. There are substantial differences in these views by age, race and ethnicity, education, and religious affiliation. By about two-to-one (63% to 31%), adults younger than 30 say the court should base its rulings on its understanding of the Constitution’s current meaning, rather than what it meant when originally written. Views among those ages 30 to 49 are more divided (44% original meaning, 45% meaning in current times). A 54% majority of those 50 and older say rulings should be based on the court’s understanding of the Constitution’s original meaning. Blacks (63%) are more likely than whites (41%) to say the court should base its rulings on its understanding of the Constitution’s current meaning. And adults with at least a college degree, particularly those with postgraduate degrees, are more likely than those with less education to express this view. White evangelical Protestants overwhelmingly think the court should base its rulings on its view of the Constitution’s original meaning (79% say this). By contrast, among the religiously unaffiliated, 64% think the court’s decisions should be based on the Constitution’s current meaning, while 30% say it should base decisions on its understanding of how it was originally written.